Stainless steel Integrated 3 x 1.65W 24V LED fittings, 1 x 6W 24V LED driver and 1.5m connecting cables. Sensio LED Low Voltage Triangle Under Cabinet Light Kit 24V Warm White 80lm (3 Pack) is rated 4.2 out of 5 by 6. Rated 1 out of 5 by MarshaM from Horrible, dull pinkish lighting Bought 8 of these. Had them fitted and will need to be ripped out and replaced. The warm colour is a dingy pinkish hue and give off hardly any light. utterly useless. Rated 5 out of 5 by Rooroo from Neat and easy to fit Cool white give off a nice light and they are neat. Electrician said they were easy to fit. Ordered 4 but sent one wrong item and a faulty transformer. 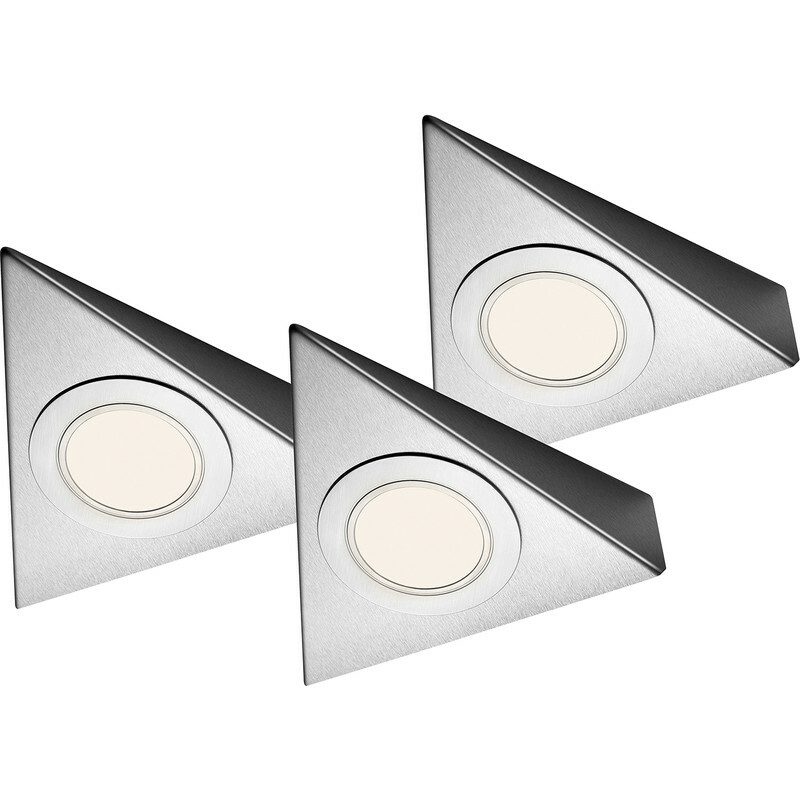 Rated 5 out of 5 by DS8819 from Good under cupboard kitchen light a good quality light for illumination under kitchen cupboards. A bit odd being 24 volts and not 12 volts. I dont know wht this is so, but it doesnt affect their performance. I guess the issue will be getting just one replacement fitting if one fails, so will inevitibly mean having to buy a full set, unlike 12 volt ones. Rated 4 out of 5 by andy207 from used in kitchen as extra lighting bought these some time ago to replace 12 volt led that had not lasted. so only just fit these seem to be ok. wouldn't recommend quality but for the price they should be ok. Rated 5 out of 5 by Jacquie from Excellent Great product, easy to fit, cool to the touch and look great in place. Rated 5 out of 5 by Spice Boy from Let there be light With pre terminated cables and plug in terminal block wiring was simple. The small size of the plugs made it simple to wire them down the back of installed cupboards without removing them. I t would have been nice to be able to buy the transformers separately.